Around town, awkward moustaches are sprouting up all over the place. Your social feed shows both men and women alike on maniacal, moustachioed missions with everything from the real thing to fingerstaches and sunstaches. Is this some sort of new Thanksgiving tradition? Is this a visible warning to all the turkey birds that the grim reaper is approaching? Though I’m sure they had the most debonair facial hair, this can’t be what the Plymouth Pilgrims had in mind. What the heck is going on? It turns out that this mad movement goes by the name of Movember and all the turkeys are really just ordinary people banding together to help raise awareness for men’s health issues and fund programs that help make progress. More specifically, the funds go to the Movember Foundation which, for the last decade, has been actively supporting campaigns to raise awareness about testicular cancer, prostate cancer, and men's mental health issues. This all started in Australia in 2003 when Travis Garone and Luke Slattery thunk up the idea over a few pints. It began with a question about where the art of the moustache had gone. It ended with the start of a new campaign. Inspired by a friend’s mother who was fundraising for breast cancer, the gents set off to do something similar for men’s health, with prostate cancer as their initial motivation. Today, the movement has become a worldwide phenomenon. In 2012, over one million Mo Bros and Mo Sistas together raised $147 million for the cause. 1 in 2 men will be diagnosed with cancer in their lifetime, 1 in 3 women will be. Prostate cancer is the most frequently diagnosed cancer in men after skin cancer. Testicular cancer is the most common cancer in American males between the ages of 15 and 34. 97% of prostate cancer cases occur in men age 50 and older. Men generally have lower levels of awareness of mental illnesses than women. One of the most common manifestations of mental illness is depression. Over 6 million men (7% of the population) are diagnosed with depression each year. Friends of Viget have joined up with friends of DC’s Web Development Group to form a team to help with this worthy cause. We’re encouraging you and your friends to join our team of 20+ in support of this effort. Anyone is welcome, so please tell a friend. Pre-mo baby faces. Viget (left). Web Development Group (right). 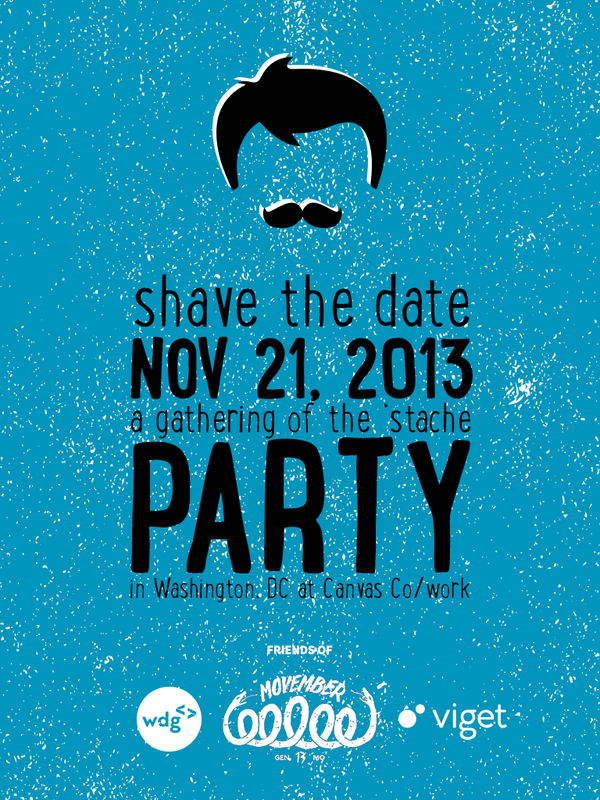 Also, if you’re in the Washington, DC area on November 21, 2013, we hope you’ll join us at the Gathering of the ‘Stache party organized by WDG, co-sponsored by Viget, and hosted at Canvas Co/work. Space is limited so grab your ticket today. We’ll see you there.